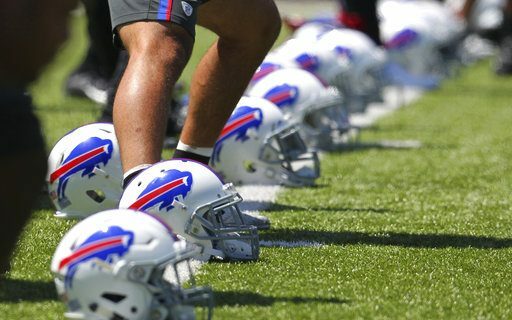 It looks like Eric Wood is healed from his broken leg and ready to return as the starting center, and that means the middle of the Bills offensive line is set. After experimenting in the offseason with Dawkins at left tackle, it looks like Glenn is healthy and ready to man his regular spot on the left side. Would there be any thought shifting Glenn to the right side? Does it make sense to have a veteran like Glenn on the right side, to block against left defensive end opponents like Khalil Mack, Tamba Hali and Von Miller? If Dawkins is more athletic, does it make sense to get him started now at left tackle? All interesting questions, but nothing more than me thinking out loud. No indication from training camp that it’s being considered. Either way, Glenn and the rookie should be solid players at those two positions. Once he adjusts, Dawkins will be a clear upgrade over Mills. If Ryan Groy can play tackle, then maybe he’s in the mix or at least the main OT backup. Incognito is all set at left guard, and one of the best in the league. I like Miller, and I like how he bounced back after an up-and-down injury-filled rookie year. But it appears that Ducasse is being given the chance to beat him out. He’s a veteran, who has some experience in this system. Groy figures to be the backup at guard and cetner. I suspect Groy’s offer sheet by the Rams was matched so he can provide insurance against a slow recovery by Wood, and then replace Wood next year when the veteran’s contract expires. I have no idea if Henderson will get healthy and clean enough to be in the mix. While the line should be a strength, my only concern is the new approach of coordinator Rick Dennison and line coach Juan Castillo. The blocking style will be different than last year, and that means there could be adjustments. Or there could be other players better suited for that style. I would hope the coaches don’t mess too much with a true strength of the team. Overall, I’m happy with the line and I believe it’s one of the better groups in the NFL.